He then uses the money for more land, seed, fertiliser, etc. Thus he can provide more surplus food next harvest. 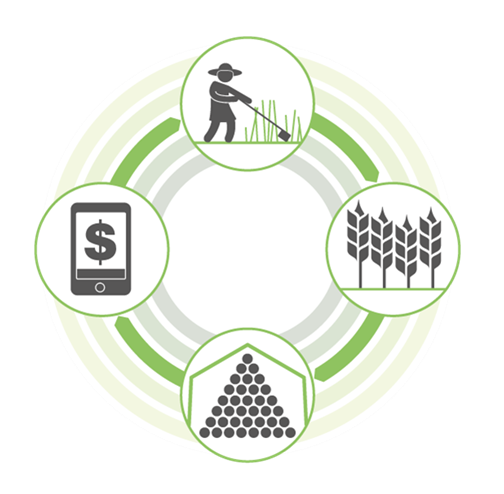 As a result of the FinComEco model the farmer is given access to a wider market for their crops as it works to bring small dealers into the Ecosystem. The technology behind the initiative is able to identify and track the farmer and his crop. As part of their involvement in the program, FinComEco will arrange for the farmer to be given free banking up to a certain number of transactions per year. Gradually, farmers can be offered low-cost loans for fertiliser, seed, tractors, land, etc. as an alternative to the clutches of local moneylenders and small-scale dealers in crops. FinComEco will supply the mobile banking used by the farmer and also give access to market-price details of crops on his phone. Eventually, after experience and education, the farmer can sell his crop forward or hedge his prices with futures. 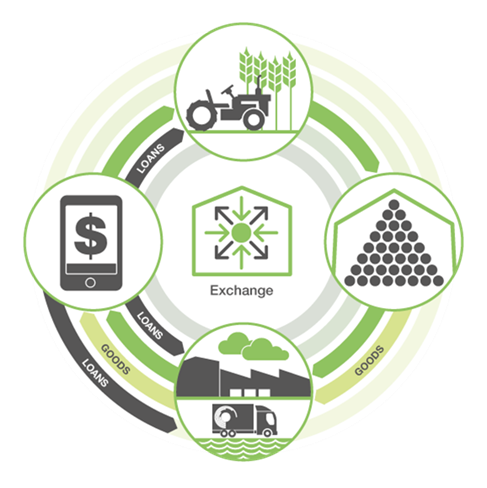 Some of the benefits for the Exchange as a result of successful implementation of this financial infrastructure include: electronic warehouse receipts are more easily validated and financed; banks gain large numbers of smallholder farmer customers which will gradually turn into local businesses; growth in other financial areas such as insurance; and improved tax revenues to support government investment in infrastructure. The growth in agri-businesses will create new commodities to trade and businesses to list on the local stock exchanges. The increase in food surpluses and agri-products leads to the opportunity for exports and reduction in imports. This tier of the FinComEco model illustrates the ecosystem where the markets of one country are linked to strengthen and deepen them. 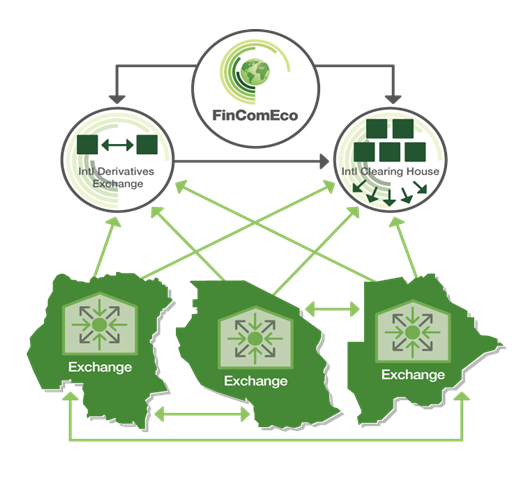 FinComEco operates a single derivatives exchange as well as a CCP Clearing house by which local regulators from each individual country control access and use. As a result the exchanges begin to facilitate trade between themselves and each other’s commodities and derivatives, which then further stimulates trade on an international level. The increasing use of exchanges encourages growth into other commodities and instruments.